Strategic uncertainty in East Asia is leaving nations look to their defences. At the same time, the United States is leading a push to reduce the role of nuclear weapons in international security. In this major international research report, the Lowy Institute's Rory Medcalf and Fiona Cunningham have worked with a team of experts from Japan, China, South Korea and Australia to look at what these cross-cutting trends mean for the future of nuclear weapons in the security of US allies in Asia. This project involved collaboration with the Japan Institute of International Affairs and support from the Nuclear Security Project of the Nuclear Threat Initiative. A web of strategic mistrust in East Asia involving China, North Korea, America and key US allies is holding back President Obama’s global push to rid the world of nuclear weapons. 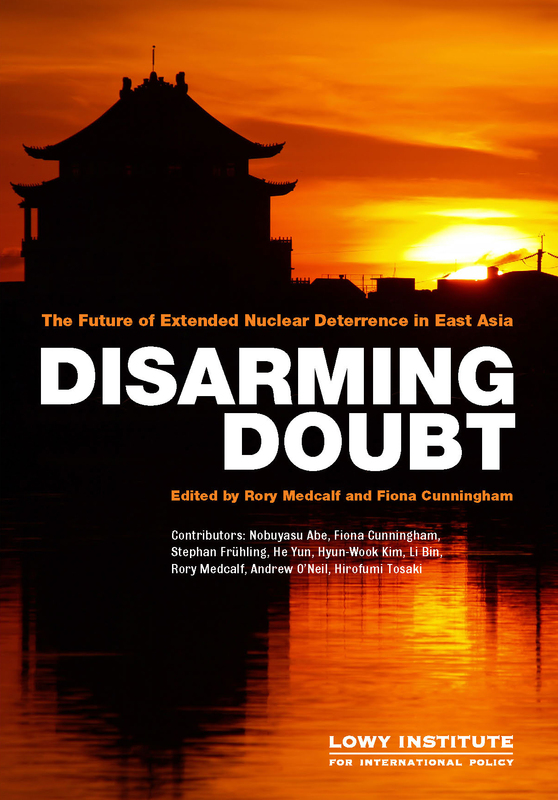 This is a key conclusion of a major international report, Disarming Doubt: The Future of Extended Nuclear Deterrence in East Asia, based on extensive consultations with nuclear and strategic specialists in Japan, China, South Korea and Australia. The publication, edited by the Lowy Institute’s Rory Medcalf and Fiona Cunningham, includes contributions by nine expert authors from those countries. · And China is unlikely to change these positions unless America accepted a growing degree of vulnerability to Chinese nuclear weapons, which in turn would worry US allies. This situation could be worsened if the high cost of conventional weapons ever drove a future US Administration to expand the role of nuclear armaments in America’s strategic ‘pivot’ back to Asia. The report outlines practical policy recommendations for governments to untangle Asia’s nuclear dangers, including a seven-stage process of dialogue, confidence-building and defence policy adjustment. These steps include refining extended nuclear deterrence to countering ‘existential’ threats only, the strengthening of conventional defences by US allies, a US-China strategic stability dialogue not confined to nuclear weapons, and a shift by Beijing away from tolerating North Korean provocations. The report is part of a wider collaborative project between the Lowy Institute and the Center for the Promotion of Disarmament and Non-Proliferation, Japan Institute of International Affairs. The project was supported by the Nuclear Security Project of the Nuclear Threat Initiative. All views contained in the report are the authors’ alone.